Vadapathirakaliamman means the pure as fire protective Motherly spirit from the North. Vadapathirakaliamman is the same deity as Sri Mariamman; Veeramakaliamman refers to an attribute of the Mother Goddess. 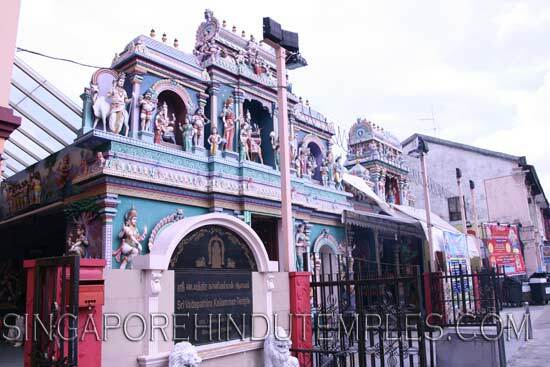 The Temple was founded as a small shrine by Tamil Hindu residents of Potong Pasir who wanted the protection of Mother Goddess and to sustain their cultural heritage. Sri Vadapathira Kaliamman Temple was developed under leadership of Rengasamy Murier, Murugaiyan, Samiappan and Vairappan Thevar. Initially, it was just small shed at upper Serangoon road. Management of the temple eventually passed to B. Govindasamy Chettiar. B. Govindasamy Chettiar, the pioneer labour contractor to the port of Singapore, who is a philanthropist and Indian community leader came to Singapore from South India(chennai) at the age of 16 in 1905. He initially partnered with Mohammed Yusof and later solely managed the Indian Labour company which supplies Indian labourers such as stevedores, lightmen and other wharf worker to the harbour. At one time, he had 3500 Indian workers under his employment, in addition to Chinese coolies. Adjoining the offices were the quarters for some of his staff. There was also a large kitchen which never stopped functioning as free meals were supplied day and night. Free meals were served to all those who worked in the port as well as those who lived outside it. Govindasamy Chettiar donated freely to charities and Temple funds; he helped to complete the renovations of the Sri Mariamman Temple and served as trustee of this temple for many years. Before B. Govindasamy Chettiar's death, he requested his nephew and son-in-law the late S.L. Perumal to build a new main tower the "Rajakopuram" and other additions to the Vadapathirakaliamman Temple. S. L. Perumal agreed and kept his word. When Hindu devotees worship here they feel the sanctity of this house of worship. S.L. Perumal built the present Temple at his own expense. The Shirdi Sai baba Temple is now part of Sri Vadapathira Kaliamman Temple. 3rd floor function hall of Sri Vadapathira temple has been secured and converted exclusively as Shirdi Sai worship centre. The Centre is devoted to celebrating the life and teaching of Shirdi Sai Baba only.